All you need for a perfect night out at Belvoir. 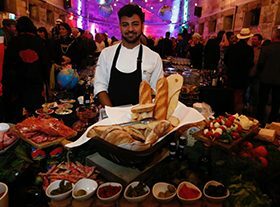 Belvoir is conveniently located just minutes from Sydney’s Central Station, and the area offers a diverse range of culinary options to suit almost every palate. You can choose from award-winning restaurants, stylish wine bars or our very own Hal Bar, located in the foyer of the theatre. At the theatre, our selection of light meals, snacks and sweets, is available 90 minutes prior to each performance and during interval. We also serve Handpicked Wines, Archie Rose and Coopers to ensure a great range of beverages to enhance your theatre experience. We love local businesses and aim to work exclusively with local suppliers and local restaurants. So here’s our inside scoop on getting the most out of your next trip to Belvoir. We have both snacks and light meals on offer at the Hal Bar, and cater for many dietary requirements. For further information on dietary requirements please refer to our supplier’s websites Big Crunch Sushi and Serendipity Ice Cream, and our partner’s website Bourke St Bakery. Belvoir’s Hal Bar is a Sydney theatre institution. It’s the perfect place to meet up with friends before the show starts, or grab a drink after to continue chatting about the show. You never know who you might see! Handpicked is a contemporary and dynamic Australian wine company. They ‘handpick’ the wine regions and grape varieties from around Australia and beyond to craft an impressive range of wines. This local business that brings some of the world’s best wines to our theatre for you to enjoy. And if you’re keen for more, their cellar door is just down the road in Chippendale. Archie Rose Distilling Co. is dedicated to honouring Sydney’s rich spirit-making past and shaping its future at their boutique distillery. We are delighted to offer a range of spirits, made by hand, by some of the country’s best distillers. We also recommend you visit their custom-made distillery and bar in Rosebery, Sydney. There’s a reason Archie Rose is one of our favourite partners. Take a sip and you’ll taste why. We offer a range of beers and ciders made by Coopers, Australia’s oldest family-owned and run brewery. Chic & sophisticated modern Middle Eastern dining just a few steps from Belvoir’s theatre doors. Open pre- and post-show, Zahli brings an added dimension to traditional Lebanese dishes, introducing their take on the region’s most iconic flavours. The team from SOUL Dining provide creative food from the heart – too Korean to be called modern Australian, not traditional enough to be called classic Korean. 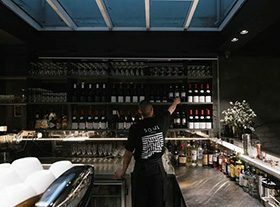 We love their plush blue velvet seating and impressive bar of Australian wines, Korean lager, classic cocktails and kimchi-brine Bloody Marys, just for fun! 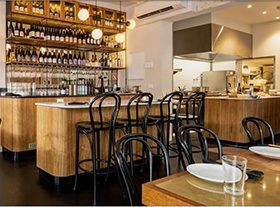 Arthur is Surry Hills’ newest neighbourhood restaurant, and our newest event partner! Headed up by Tristan Rosier, the team aim to showcase their excitement for local produce through the constantly evolving set menu and all-Australian wine list. Bourke St Bakery began as a little corner store bakery cafe in Surry Hills in 2004, born of a love of good food and an appreciation of all things hand made. It’s now a Sydney institution with 10 bakeries and outlets around the city. Situated in the heart of Potts Point, Regents Court offers a collection of unique, art deco studio apartments, making it Belvoir’s home away from home. Allow yourself to be capivated by Regent’s Court secret roof top garden, or immerse yourself in the foodie culture of the area. Adina Apartment Hotels offer the modern explorer apartment living with space to stretch out in the heart of a neighbourhood, combining do-it-yourself experiences and the ease of hotel services. Contemporary living and working spaces with kitchens and laundries encourage guests to “live like a local”. We really love Piquant Catering. They are a boutique catering and food management business that specialises in innovative and exceptional food. Available for every event, private and corporate, Piquant Catering will make your event special and personal. We are centrally located in Surry Hills and close to a lot of major public transport. Call the Transport Infoline on 131 500 or visit transportnsw.info to plan your visit. Surry Hills, our home of 34 years, is changing fast. The construction of the light rail is an exciting development for our part of town, but it can bring some added transport challenges. We’ve listed the best ways to get to Belvoir below. We’re just a five-minute walk from the Devonshire St/Chalmers St exit of Central Station. Buses travel along Chalmers St, Elizabeth St and Cleveland St, an easy walk away from the theatre. There is NO onsite parking, but limited timed parking is available on the streets around the theatre, especially on the far side of Cleveland St. There are bike racks outside the theatre should you choose to cycle. Progress continues to be made on the new Light Rail and we can’t wait for the Ward Park stop to open. The Light Rail is currently scheduled to be completed by March 2020. To stay up-to-date with developments, check here. Click here to find out where we are and how to get here!